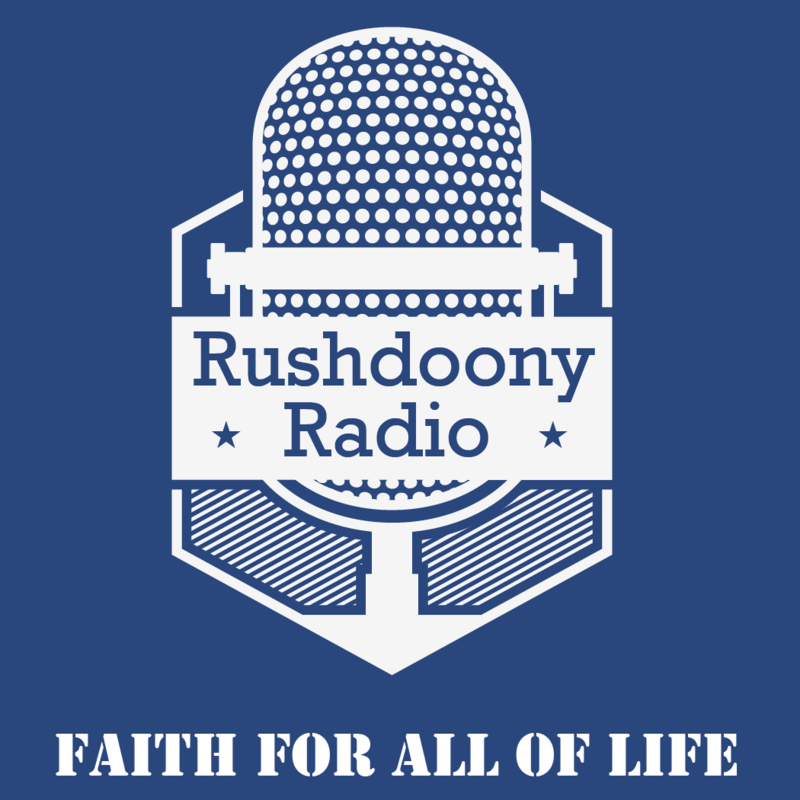 R.J. Rushdoony: 00:01 Our scripture this morning is Saint Luke the second chapter, verses 1 through 20. The holy family. Luke 2:1 through 20. It came to pass in those days that there went out a decree from Caesar Augustus that all the world should be taxed. The taxing was first made when Cyrenius was governor of Syria and all went to be taxed, everyone into his own city. And Joseph also went up from Galilee, out of the city of Nazareth, into Judaea, unto the city of David, which is called Bethlehem because he was of the house and lineage of David, to be taxed with Mary his espoused wife, being great with child. So it was, that, while they were there, the days were accomplished that she should be delivered and she brought forth her firstborn son, and wrapped him in swaddling clothes, and laid him in a manger because there was no room for them in the inn. There were in the same country shepherds abiding in the field, keeping watch over their flock by night. R.J. Rushdoony: 02:29 They came with haste, and found Mary, and Joseph, and the babe lying in a manger and when they had seen it, they made known abroad the saying which was told them concerning this child. All they that heard it wondered at those things which were told them by the shepherds. But Mary kept all these things, and pondered them in her heart. And the shepherds returned, glorifying and praising God for all the things that they had heard and seen, as it was told unto them. R.J. Rushdoony: 04:18 He found the world moving to another Bethlehem, another birth, but this time the birth of the beast, of a monster, of an age of chaos and anarchy and terror. The time of the beast. So the last two lines of this poem read, “What rough beast, if thou art come round at last, [inaudible 00:04:52] us towards Bethlehem” [inaudible 00:04:57] … Indeed, men today are doing everything possible to bring about that birth of the beast and a new Bethlehem. The birth of total terror, total anarchy, total chaos, but the sad fact is that those who should be witnessing against it are afraid to speak out or are too ignorant of scripture to speak out. R.J. Rushdoony: 05:37 Not too long ago, I had a long conversation by phone with one of the most prominent ministers in the country, and let me add, one of the most prominent conservative ministers in the country. He was in agreement as to what’s going on. He was in agreement as to the breakdown of law and order. He was in agreement that capital punishment needed to be enforced and it was a sorry thing that there was scarcely an execution in the country last year even though numerous men have been sentenced for execution but he was not ready to say that the law of God requires capital punishment. That was [inaudible 00:06:38] under law and we’re not under law any longer, he said. R.J. Rushdoony: 06:42 So he said, “I’m for it but I will not preach about it because I don’t feel as a minister I should preach about anything but grace, and how can you have grace in a lawless world? In a world that despises God’s love?” This is to move towards the position which Saint Paul condemned. “Shall we sin that grace may abound?” But we are told in the Christmas story that the reason why the holy family moved to Bethlehem was in fulfillment of the law of the day. In other words, they respected Caesar’s law in starting the census and in fulfillment of prophecy because the Messiah was to be born in Bethlehem, the city of David, because he was of the house and lineage of David. Jesus was born into a Hebrew family, an heir of a royal line in terms of prophecy and fulfillment of prophecy and in terms of the laws of the family and the laws of inheritance. He did not come, he said, to set aside the law but to fulfill the law. To establish it, in other words, more firmly. R.J. Rushdoony: 08:26 Let’s examine certain aspects of Christ in the family and its relationship for love. First of all, our Lord was born of the lineage of David and as heir of the throne of David, and in fulfillment of promises concerning the future meaning of the throne. In second Samuel the seventh chapter, the 12th verse, God declares to David, “When thy days shall be fulfilled and thou shalt sleep with thy father as I will set up thy seed after thee, which shall proceed out of thy bowels and I will establish his kingdom.” In Psalms 89 and 132, this promise is further repeated. Notice that the kingdom is defined not as “thy kingdom, David,” but his kingdom. It is Christ’s kingdom and it is to be set up in terms of his kingship, his calling and his purpose, so that it will be no longer David’s kingdom, Israel’s kingdom, but the Messiah’s kingdom in fulfillment of his prophetic plans. R.J. Rushdoony: 09:53 Secondly, the prophecies concerning the coming of our Lord emphasize that Christ’s kingdom is the beginning of the restoration of authority and of law and order. In Isaiah, the first chapter, the 26th verse, a declaration is made. “I will restore by judges as at the first, and thy counselors as at the beginning. Afterward, thou shalt be called the city of righteousness, the faithful city.” In other words, the Messiah will bring about the fullness of the meaning of the judges that is civil rulers and counselors as they were ordained at the mount when the law was given to Moses so that in his coming, he fulfilled the law. He restores the meaning of authority and of law and order. R.J. Rushdoony: 10:52 And so it is. The Messiah is spoken of the one under whom law and order are brought to fulfillment. He is the wonderful counselor, the mighty God, the everlasting father, the prince of peace, of the increase of his judgment and peace, there shall be no end upon the throne of David and upon his kingdom. To order it and to establish it with judgment and with justice from hence forth even forever, so declares God through Isaiah, the ninth chapter, verses 6 and 7. In other words, judgment and justice are the cornerstones of Christ’s reign, of Christ’s kingdom. He comes about, brings in the fullness of law and order. Again, Isaiah declares that he is the shoot of the stalk of Jesse who shall with righteous judge the [inaudible 00:12:01] and reprove with equity the meek of the earth. R.J. Rushdoony: 12:05 We are further told in the 11th chapter, the fourth verse, “He comes to bring justice and to slay the wicked. In the psalms we read earlier in our [inaudible 00:12:20] reading [inaudible 00:12:23] coming an answer to the prayer of those who are under in justice, to put down the evildoers, to slay the wicked and to restore paradise so that figuratively the wolf and the lamb dwell together. That is those which in sin and a state of sin are tearing one another part or [inaudible 00:12:49] at the weak or brought together in Christ. So that, as Isaiah declares in the 35th chapter, the first verse, the wilderness and the parched land shall be blessed and the desert shall rejoice and blossom [inaudible 00:13:07]. R.J. Rushdoony: 13:08 As the work of Christ is proclaimed unto all people and as all people submit themselves and the whole [inaudible 00:13:16], there are farming [inaudible 00:13:20], their government, their [inaudible 00:13:24], everything for the word of God, the very fertility of the land is restored and the parched land blossoms and the desert blooms. This is a part of the Christmas story. It is sung every Christmas. Go back over the word from the hymns, one of them, Joy to the World. The Lord is come, and what shall happen no more shall farms infest the earth. Why? Because as his grace moves out, his dominion and his law and order are brought in and the curse is removed and the earth blossoms. The wilderness and the parched land shall be glad and the desert shall rejoice and blossom as the [inaudible 00:14:29]. R.J. Rushdoony: 14:28 Third, Christ’s kingdom is not limited like David to Canaan. It covers the earth. Blessed are the weaker, our Lord declared, for they shall inherit the earth. Blessed are they who are tamed by me, or humbled and become open to [inaudible 00:14:41] by my grace, for they shall inherit the earth, and as Saint Paul declared in Romans 4:13, “For the promise that he should be the heir of the world was not to Abraham or to his seed through the law but through the righteousness of Satan.” When Saint Paul here speaks of law, he means not by the law of inheritance, not by blood, not to Israel after the flesh but to the Israel after the spirit who inherits by faith. If he be Christ, then are ye Abraham’s seed and heirs according to the promise. R.J. Rushdoony: 15:49 There are those who seek to deny Christ’s kingship over the earth. In fact, not too long ago, the editor of one of the major publications in evangelical circles wrote me a long poisoned pen letter in which he declared I was perverting people by teaching that Christ’s kingship was over the earth and he cited this verse, John 18:13, when our Lord said, “My kingdom is not of this world.” I wrote right back to him and cited all the great commentators who declared that this means that it is not derived from this world. He does not owe it to this world because it is derived from God. It is our God and over this world. The very verse he cited against Christ’s kingship as always been known by every Greek scholar of any stature to mean, that it is from God and over the world and bought by his virgin birth. R.J. Rushdoony: 17:04 Jesus Christ was a new creation, a new Adam, like the first Adam [inaudible 00:17:13] miracle of creation directly from God, but unlike Adam, the very son of God on the one side and on the other linked to the old humanity born of Adam by his birth from Mary. When Saint Paul speaks of Christ as the second man or the last or second Adam. As such, he is the founding head of the new humanity. 1st Corinthians 15:45 through 47, the great passage in which he speaks of our Lord as the second man or last Adam. As the new Adam, he is the founding head of a new humanity, a new human race to replace the old Adamic race. It’s then at the purpose of God. The old humanity is to be converted or cut off, and the new humanity is to replace it. R.J. Rushdoony: 18:21 The first Adam was tempted in paradise and fell. The second Adam was tempted in the wilderness signifying what the world had become under the first Adam and he tried, and as the true Adam, he now exercises dominion. He is the lawgiver. He declared this in the sermon on the mount. Now to proclaim law, his assumption of kingship, of sovereignty, and kings in ancient times proclaimed the law in the name of their God. Moses proclaimed the law in the name of God, the king of Israel, and so he said thus saith the Lord. The Babylonian monarchs proclaimed the law in the name of Marduk. Jesus Christ said, “I say unto you.” He proclaimed it as God and king and he cited the law that had been given unto Moses and then interpreted it as his own words. R.J. Rushdoony: 22:48 Earlier when his mother and his brethren came to prevent him from speaking because they were fearful of the cost of his words, that it would lead to the cross, he made it clear that they were not his family if they did not believe in him and so he turned to those who believed in him when he was told his mother and brethren were outside and he said, “Behold, everyone who do the will of my father in heaven, my brother and my sister, my family.” But in spite of that, he fulfilled his responsibility to his mother even from the cross. This brings out an aspect of heirship that is now forgotten. In terms of physical wealth, true heirship means not only possessing an estate but inheriting the responsibilities that go with it. So Jesus Christ, as the heir in the holy family inherited the responsibilities of the family so that while there was probably no estate, Joseph being a humbled carpenter, Jesus Christ inherited the responsibility, took care of his brothers and sisters until they were of age, took care of his mother to death and provisioned for her after death. R.J. Rushdoony: 24:37 He handed her over his responsibility unto his cousin John, who came from a family of some means. Heirship is responsibility. No one has a right to make an heir of anyone if they have not both faith and responsibility. Jesus Christ stands as the son and heir in the holy family, assumed his responsibility taking over the role of the father, taking over the care of his mother as heir to the throne of David fulfilling his responsibilities in terms of the kingdom, establishing the law and order and summoning all of us to carry forth that dominion unto all corners of the earth, fulfilling his loyal responsibilities and his racial responsibilities as the head of the new humanity. R.J. Rushdoony: 25:56 Thus the good news at Bethlehem. When the angels came and proclaimed to the shepherds, “Fear not for behold I bring you good tidings of great joy, so it shall be to all people, for unto you us born this day in the city of David a savior which is Christ the Lord.” That good news was as the king, the true heir, comes to fulfill his responsibilities to establish dominion in the name of God and the law and order over all the face of the earth and all who receive his grace are to partake of that dominion over the earth. Blessed are the meek, those who have received his grace, for they shall inherit the earth and shall delight themselves in the abundance of peace, for unto us is born a savior which is Christ the Lord. Let us pray. R.J. Rushdoony: 27:22 Our Lord and our God, we thank thee that Jesus Christ is our king, our Lord, our savior, and that he is at work now to destroy the false ones and to establish his kingship, and that world is not moving to the birth and triumph of the beast but to the victory of our Lord and savior, Jesus Christ. [inaudible 00:27:58] Our father in this space, faithful in his praise and service, ever mindful that the kingdoms of this Lord shall become the kingdoms of our Lord and of his Christ. Oh Lord our God, how great thou art [inaudible 00:28:22] in Jesus name, amen.